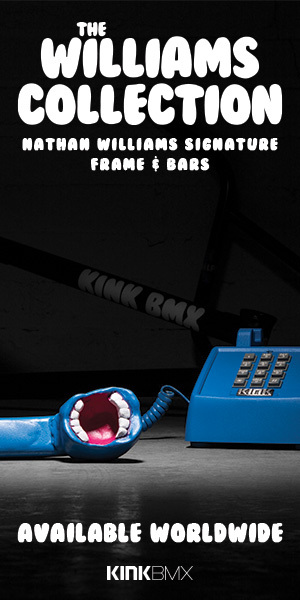 Are you thinking about picking up a new BMX Frame? Have you taken a look at Alex Coleborn‘s signature Hangover H2 frame from Total BMX yet? This frame is made from 100% 4130 Japanese chromoly tubing with a 75-degree head tube angle, 71-degree seat tube angle, 11.5″ bottom bracket height, 7.3″ standover height and a 12.93″ – 13.2″ chainstay length. You can find a heat-treated Integrated head tube, butted top and down tube, tapered down tube, tapered seat tube, heat-treated Mid bottom bracket, tapered seat and chain stays, a custom seat stay bridge with the Total BMX logo, removable seat stay brake mounts and 6mm thick heat-treated dropouts with integrated chain tensioners. The Hangover H2 frame is available in 19.8″, 20.4″, 20.6″ and 21″ top tube lengths with black, chrome, sparkle green and sparkle orange for colors and can be picked up through BMX shops and mail-orders that carry Total BMX worldwide!